Originally, the Rollin Furbeck House was a wedding present for Rollin Judson Furbeck from his stockbroker father, Warren F. Furbeck, in 1897. Rollin was the third of five sons. That same year, Warren also gave his first son, George, a Wright house located in Oak Park at 223 North Euclid as a wedding gift. Most likely, Rollin's mother, Sophia Wapples Furbeck, was the one who made the decision to use Wright as the architect. According to the May 7, 1897 issue of the Oak Park Vindicator, Judson L. Wapples sold the land to his son-in-law in 1896, and construction began the following spring. The land was purchased for $2,250, and the house was built for $6,000. Rollin and his wife, Elizabeth, lived at their home for about one year, when they sold it and moved into another house designed by George W. Maher at a cost of $12,000. This house was once again financed by Rollin's father. In November of 1899, Rollin moved to New York City, where as a member of the New York Stock Exchange he headed the east coast offices of the newly-founded W. F. Furbeck Company. Rollin's brother, George, lived in his home until September of 1899, when he moved to another house. Since the time of the original owners, The Rollin Furbeck House has transferred ownership several times. The dramatic facade and pronounced three-dimensionality of the design combine to give The Rollin Furbeck House its imposing presence. From its original days, when carriages would bring guests up the driveway from the street and pass through the Porte-Cochere (since enclosed), to the present, The Rollin Furbeck House was, and remains, one of the most handsome and memorable residential designs in the western suburbs. The house was executed during a period in Wright's career spanning the years of approximately 1897-1903 when he was experimenting with the construction of vertical elements (note the home's massive three-story center tower and vertical octagonally-fluted colonnettes) and the characteristic horizontal features that resurface so consistently in his subsequent works. The sheltering lowpitched hipped roofs with wide overhanging eaves, broad, central chimney, brick string courses and corbel table, window hood moldings and projecting sills of Bedford limestone (united by the brick string courses) and banded windows are all pure Prairie attributes emphasizing the horizontal. Other characteristic Wright features include the continuation of the surface used on one story to the window sill level of the next story (in this case, brick from the first to second floors, and stucco from the second to third); the almost "ritualistic" journey to an obscured front entrance (visitors must turn twice before reaching the front door); the use of simple geometric shapes; and the implementation of architectural veiling with visually-protective colonnettes in front of textured diamond-paned windows. On the west side of the house, Wright introduced a new surface material, cedar shingles, giving the back side of the home a more informal flavor. At the rear on the third story level of the vertical tower, Wright employed a significant experiment with a balcony that is believed to be his first use of a cantilever in a domestic design, a device subsequently used in so many later designs. The balcony, since enclosed, was cantilevered well beyond the second story exterior wall structural support (see attached Thorpe conjecture of the original 1897 west view). In 1988, the present owners enclosed the area below the cantilever. The Rollin Furbeck House can be likened to a frozen architectural time frame in the evolution of Wright's career...a visual preservation of the crucial turning point that represents his progression from early influences to the implementation of the essential elements that would become his mature Prairie Style. Wright's predilection for abundant natural light is integrated into the overall design by an open floor plan conducive to entertaining on a grand scale. It is this free flow of space within a transitional outer form that provides the greatest source of excitement in experiencing this home. Upon entering the foyer of this large home, the ingenious way Wright manipulates space is already at work with a free-flowing design enhanced by romantic alcoves. This "breaking up of the box" was quite a departure from other Victorian-period architectural styles, and is still popular today. The original large picture window is thought to be the first usage ever in a single family residential design. The original quarter sawn white oak floor (tongue and groove) has an interesting pattern. The centrally-located inglenook, (a sought-after feature of many Wright homes) shelters the original preformed concrete fireplace, and has storage for logs built into the seats. The oak trim is also original. This beautiful and intimate space graced by original diamond-paned art-glass octagonal windows (similar to the ones in Wright's Oak Park Home and Studio) is perfect as a quiet retreat. An unusual split staircase, with wood trim leading the eye through the house, has an original balustrade with balusters similar to the ones used in the balcony of the children's Playroom at the Wright's Home and Studio. A wonderful space for formal entertaining, the Dining Room is highlighted by a large original picture window flanked on either side by magnificent geometrically-patterned art-glass side lights with green/gold hues. The north art-glass window is original (1897); the south window a fine reproduction (1985). The stunning ceiling light fixture was commissioned by a previous owner and incorporates Wright's Dining Room art glass window design. Two sets of beautiful oak-trimmed doors adorn the south wall of the dining room and gorgeous, prairie-inspired benches designed by the homeowners to fit over footings found in the floor will remain with the house. The quarter-sawn oak floor is not original, but a beautiful match. It is believed that it was Wright himself who returned and enlarged the dining room an additional five feet from the beam (c. 1907), moving the picture window and its decorative side lights to the new west wall. Wright most likely made other changes to the house at this time, most of which were probably executed toward the back end of the home. Originally the Porte-Cochere, the library has windows (with screens) on two sides. The current owners installed a new quarter-sawn oak floor, custom windows that replicate design of others in the home, the custom prairie art-glass ceiling fixture and vaulted ceiling. A charming and surprising sunken powder room is located beneath the entry stairs and has the look and feel of a library. The lovely marble vanity top is original, and the built-in dresser was designed by Wright. The room has quarter-sawn oak flooring and a unique storage area. A spectacular, state-of-the-art kitchen/family room was painstakingly created by the current owners in 2001 to resonate with the rest of the house. The renovation was the subject of a television show on HGTV’s New Spaces. Double glass doors leading into the room, leaded glass cabinets, Motawi arts and crafts tiles, and balusters under the island table and serving as a divider between the rear entry and the family room are among the many features. There is abundant cabinetry and counter space, recessed lights, seating for six at the built-in island table, and commercial-grade appliances. The family room area has built in cabinetry that holds multimedia equipment, a mud room area, and a coat closet. The expansive master four-room suite was renovated in 2003. It occupies two thirds of the second floor, and like all of the other bedrooms in the home, has coved ceilings. One enters the suite via a private, half-octagon shaped foyer that leads to the study (which has access to another bathroom and can be used as a bedroom) on one side and the master bedroom, walk-in closet and master bath on the other. The large master bedroom has the tall and beautiful original diamond-paned art glass casement windows offering breathtaking views of the exterior colonnettes and wall to wall carpeting. Surrounding the room are several elegant prairie-inspired light fixtures for heightened romance. The glamorous master bathroom is adorned with natural marble and arts and crafts tiled trim and counter, and two sinks. The bathroom contains a large hot tub, free-standing shower with a marble seat, toilet, bidet and a linen closet. The room contains two original diamond paned windows glazed partially with hammered glass for privacy. The very large closet provides built-in shoe racks, ample hanging and shelf storage and a a self-storing ironing board concealed within a built- in bureau. The third chamber has its own full bath (newly remodeled in 2003), original diamond-paned windows and fir floor, two closets (including one walk-in), and an adjoining play/sitting/ exercise room. The third floor originally housed the servant's quarters, and is comprised of two bed chambers connected by a fifteen-foot neutrally-carpeted hallway accented on one side by built-in dressers and beautiful casement windows with original diamond-paned transoms. The front chamber has beautiful diamond-paned art glass casement windows looking out toward the colonnettes, a coved ceiling and built-in three-drawer dressers and bookcases. The capitals of the colonnettes are reproductions cast directly from the originals (originals will stay with the house). The shaft of the colonnettes are the original pine. There is access to a storage area housed in the second story hipped roof through the built-in dressers. This unusually large tiled bath was renovated in 2001 and has a built-in six-drawer dresser, original tub/shower, and original diamond-paned windows. This is the space that originally looked out to the cantilevered balcony. It is a bright, clean, room with a coved ceiling and a tremendous view of the back yard grounds. The beautifully landscaped back yard features prairie gardens, art glass lanterns surrounding the multi-level decks and in-ground swimming pool. Two outbuildings at the back of the property – a three-car garage that was originally the stable, and a two-car garage -- are bridged by a custom-built arbor covering a patio constructed of brick pavers. The Historic Preservation Commission of the Village of Oak Park has bestowed two Historic Preservation Awards (1989 and 1995) for efforts to restore this home to its original elegance. 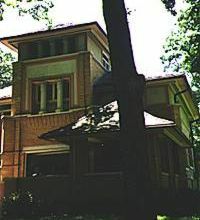 The Rollin Furbeck House has been a featured tour house in WRIGHT PLUS (Oak Park's well-known annual housewalk), in the years 1986, 1990, 1994, 2002, and 2005. It is a featured house in numerous books and publications about the work of Frank Lloyd Wright.